Writing and Healing … is a practical, yet beautiful, how-to…. As you read, it becomes quite clear why healing comes with the writing and the sharing of stories. offers writing prompts, such as pictures and objects, to encourage creativity. encourages healing. 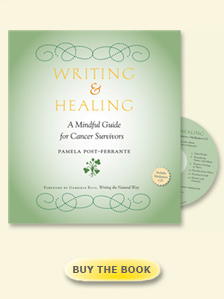 The writings are generated from meditations and themes of healing, not illness. teaches the practice of mindfulness, which relieves stress and fosters being present for oneself, others and life. shows how to use the twelve sessions led by cancer survivors or led by a professional. comes with suggestions for how to use the book alone with a CD of the twelve meditations.